Now they're talking about a Moon mission... Surrey Satellite Technology Ltd (SSTL) is designing a low cost 35kg lunar communications satellite mission called DoT-4, targeted for a 2021 launch in which the DoT-4 will provide the communications relay back to Earth using the Goonhilly Deep Space Network, and will link up with a rover on the surface of the Moon. SSTL is currently in discussions with a number of parties for the lunar mission, and expects to disclose further information on mission partners and funding early in 2019. 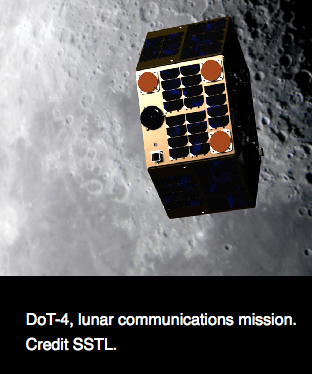 DoT-4 will be the pre-cursor mission for a larger lunar communications satellite to follow in the 2023 timeframe which will carry a more robust payload and which will also have the potential for navigation services. SSTL’s ultimate aim is to launch a full constellation of lunar communications satellites offering full service capability to enable new and regular opportunities for science and exploration and economic development of the space environment beyond Earth’s orbit. 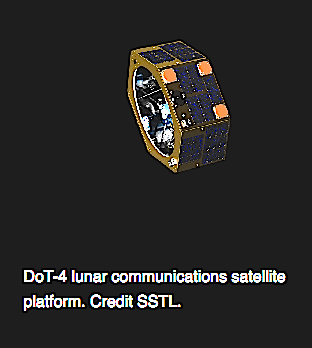 DoT-4 is one of a series of Demonstration of Technology (DoT) missions that SSTL is planning to launch over the coming years. Sarah Parker, Managing Director of SSTL, said that SSTL has led the way in pioneering the use of small satellites for over 30 years and they are now raising their sights to change the economics of space around the Moon, and beyond. Gary Lay, SSTL’s Director of Navigation and Exploration, added that DoT-4 will prove technologies in the lunar environment and enable testing of radio communications with landers and rovers on the Moon’s surface, too. During the test phase, they will assess the compatibility of their proximity communications with the surface assets and they will verify the Earth communication link with several ground stations. This small step will establish an infrastructure around the Moon to enable others to explore beyond Earth’s orbit.